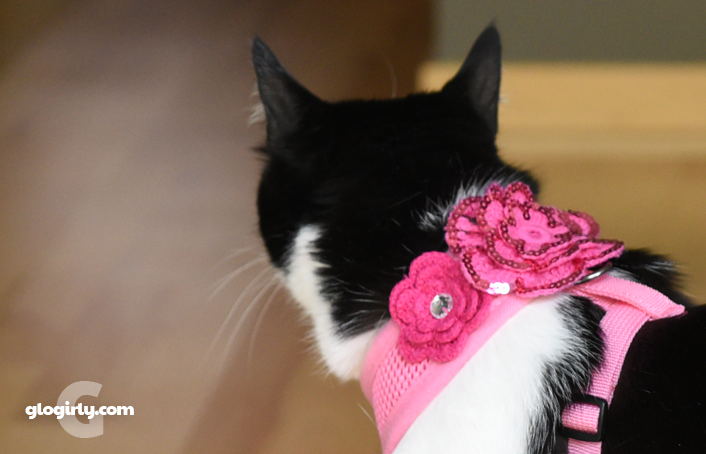 KATIE: Welcome to our special edition DIY Extreme Harness Makeover blog post. With the BlogPaws conference fast approaching, I need to make sure I've got some very special bling to wear in case I join Waffles & Glogirly for the big trip. 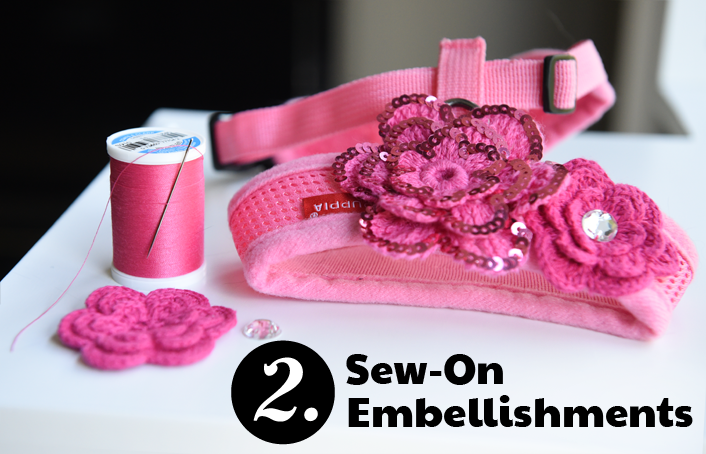 We thought you might like to see just how incredibly easy it is to take an ordinary harness from simple to SPARKLE. Alright Waffles, let's show everyone what we started with. WAFFLES: Hey Boss! Look at my pantaloons!!! KATIE: Waffles, no one cares about your pantaloons. Just show everyone our harness supplies, ok? We've tried a number of harnesses out there and our absolute favorite is the basic Puppia Soft Dog Harness. There aren't that many harnesses made just for cats, but Puppia fits us perfectly. Very comfortable and very secure. Neither of us ever try to wriggle out way out of them. We have four different Puppia's and have bought them all on Amazon. We each weigh about 10 pounds and both wear a size small. Not that we share. A basic seam ripper will make removing the Puppia logo patch from the harness quick and easy. Though the photo above shows a slight shadow where the patch used to be, it quickly disappeared with no trace left behind. The stitches are very tiny and tight so we don't recommend using a scissor. If you don't already own a seam ripper, you'll be surprised just how handy this little tool is. Even if you're like Glogirly and don't "sew." 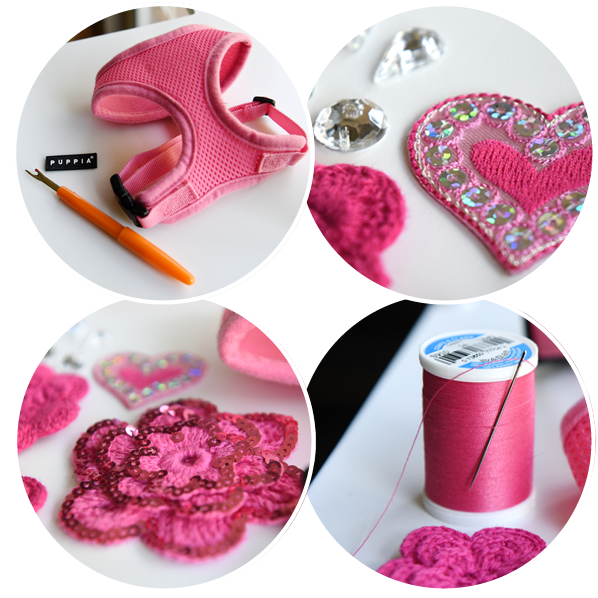 We used a combination of appliqués and jewels from our local craft store including three crocheted flowers, a heart & sequin appliqué patch and some sew-on rhinestone jewels by Darice. In order to keep everything extra secure, we chose to go the old-fashioned route by sewing on all the embellishments. We didn't want to use glue, not that there's anything wrong with that, but the crocheted flowers in particular needed to be sewn on. The matching thread allowed us to affix everything very securely without any of our stitches showing. Start by cutting each of the tiny stitches on the INSIDE of the harness to loosen the patch. Then carefully peel the patch from the front, using the seam ripper as needed. The patch is sewn on independently from all the harness parts, so there's no risk of causing any damage. Be careful though... those stitches are tiny! 1. We started by attaching the large flower to the center back of the harness. We secured all of the larger outermost petals as well as the center. 2. Next, we sewed a rhinestone to the center of each small flower before attaching to the harness. The rhinestones we used are made for sewing on and have two tiny holes to run your needle and thread through. Attaching them in this was is very secure. 3. Last, we attached the two smaller flowers to each side of the large flower just close enough so the large flower overlaps them. This also will cover the small Puppia logo on the back. The above photo shows what it looks like just before attaching the final small flower. 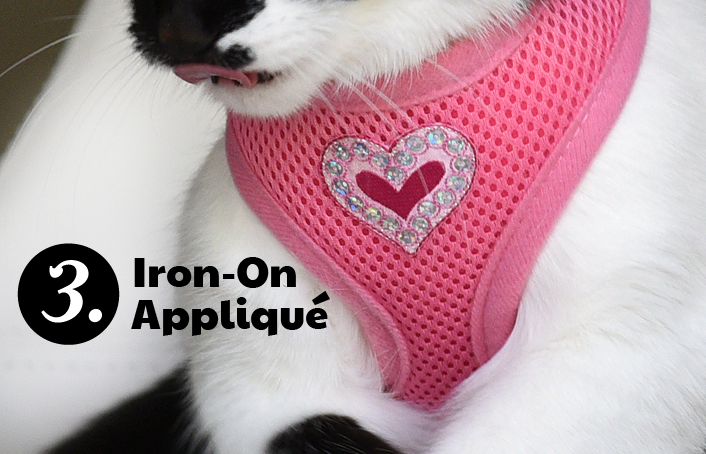 Heat your iron to a setting that's safe for the harness fabric. Position the appliqué so it's centered on the front chest area. Cover the appliqué and front of the harness with an ironing cloth; we used a pillowcase. Press the hot iron down for 10-15 seconds. Turn the harness inside out and repeat from the inside of the harness. Let everything cool. 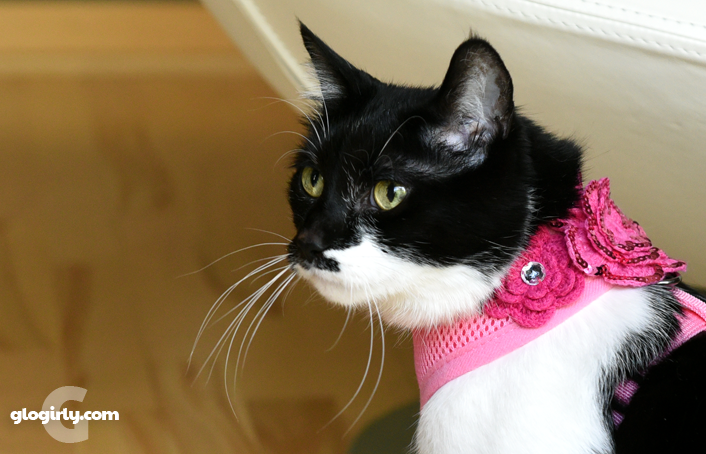 We hope you enjoyed our DIY harness makeover! We'll be doing something similar, though less girly, with one of Waffles' harnesses soon too. I want my human to pimp my Puppia! But she is probably too lazy... will I have hide my face in embarrassment at BlogPaws? Katie - you sure are going to be the Belle of the Ball at the BlogPaws conference. I've always loved those Puppia harnesses too... 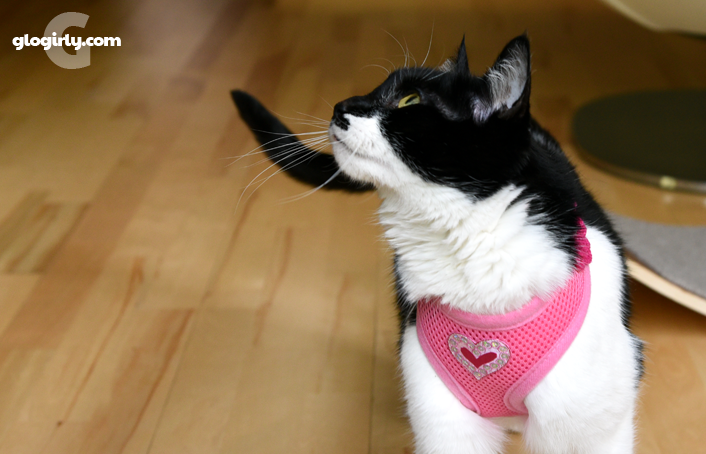 I bought Callie a cat harness, which I don't really like. I was thinking about buying one with a similar style to Puppia but they were for dogs and I started thinking that maybe I better not lol. Anyways, I may have to get one to bling out now! Even if Katie doesn't make the trip she STILL looks awesome!! Great job GloGirly! Katie looks like a princess! Wow! Great job, Glogirly! It's beautiful like Katie! The head peep was pretty impressed by the variety of designs that Puppia was coming out with on their harnesses, but your harness takes it to a whole, new level, Katie! Really? You might come to BlogPaws, Katie? How fun would that be! The harness looks beautiful. Katie, you will be the belle of the bal wearing your rew harness. That lIs stunning ln you. Glogirly sure is cleaver to be able to make that for you. Your harness is very beautiful, Katie! Very beautiful. Enjoy your week. Oh wow I love this idea! Thank you!! What a pretty harness, Katie! We're impressed you've taken to the harness so well :) Ready to see what Waffles' decorated harness will look like! That's very pretty, Katie. This is inspiring. Mickey Mouser has a purple Puppia harness and I've been wanting to take the Puppia name off the front. Can't wait to see the manly Waffles version. Love his pantaloons! That is absolutely fabulous, Katie! Glogirly's talents know no end! Absolutely gorgeous! You need to sell these! What a cool harness Katie!! I want one, too! What a great idea! 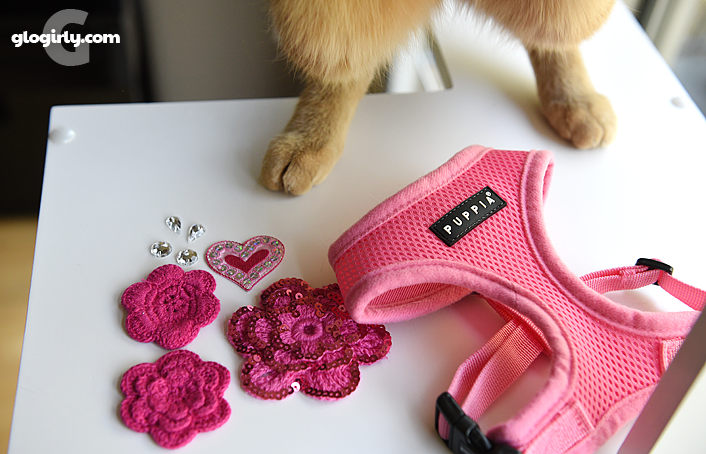 I may have to make one for Luna for BlogPaws too! Is the other harness going to look like an Elvis costume? Katie you will be all set for the pawparazzi that will be sure to crowd around you every time you appear. Heh heh, I don’t think Puppia will appreciate that you took their logo off but you were VERY smart to sew rather than glue. Glueing would make them easier to bite off. You look lovely, Katie! BTW, we used your affilliate link to buy the probiotics and some Precious Cat litter. Enjoy the little commission. You look beautiful in your harness Katie. Mom loves it so much - she's getting some ideas! It's almost as beautiful as you Katie..Great job for a non-sewer Glogirly..and yes Waff..we see your cute pantaloons..mol..
MeWowZa! You Look Mah-Vah-Lous! 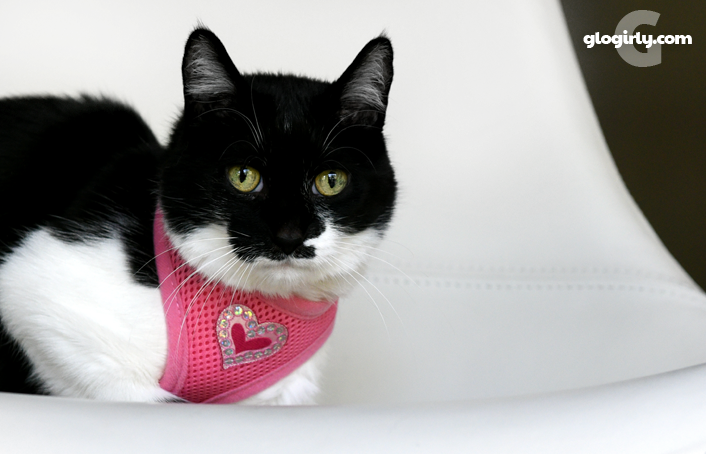 Coco's fav color is pink and we both think it accentuates your feminine feline flair for dazzling your fans!